This night ride was led by Performance Cyclery out of Valencia. Started at Susana Pass on Rt 118, elevation 1600 feet. 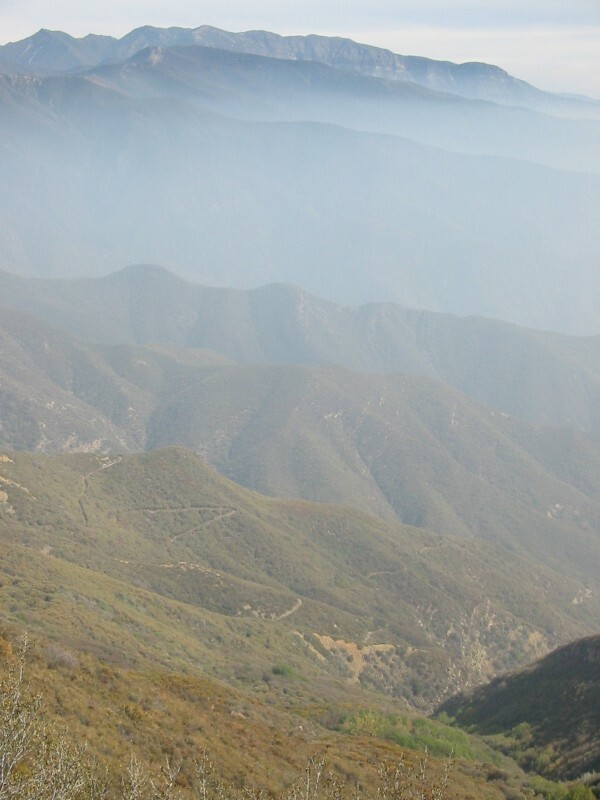 Climbed Rocky Peak fire road to 2700 feet in 3 miles. 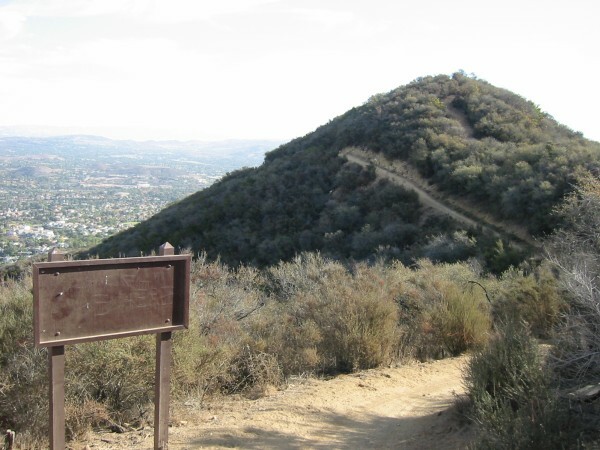 After some roller-coaster fire road action, the Chumash trail is taken down into the Simi Valley. Having never ridden this trail, bombing down it at night scared the crap out of me. The trail switch-backs down a very steep mountain, just how steep was hard to tell. Only saw blackness when peering over the edge in places. Really had to watch those outside corners that snuck up on you. You didn’t want to go over the edge. All of the other 25 or so riders were familiar with this trail and literally left me in the dust. One thing I learned about dusty SoCal night riding: Single headlamp system doesn’t work that well. Too much reflection off dust whites things out. It’s been months since it last rained in SoCal. No pictures since night ride, but view of lit up Simi Valley sure looked nice. The descent drops about 1700 feet, so 600 feet of climbing on paved road is required to get back to car. Very nice 12 mile loop. Did a 27 mile loop here. 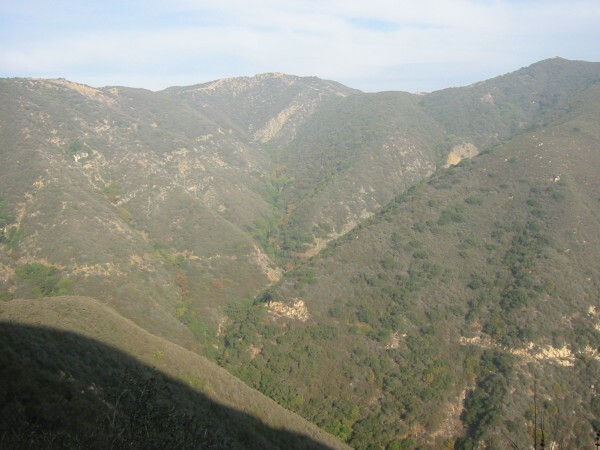 Three significant climbs in this loop, Big Sycamore Canyon fire road, Ranch Center road, and Guadalasca singletrack trail, totaling 2500 feet. Started at Point Mugu State Park entrance on the coast. Very nice scenery here. Saw lots of mule deer. 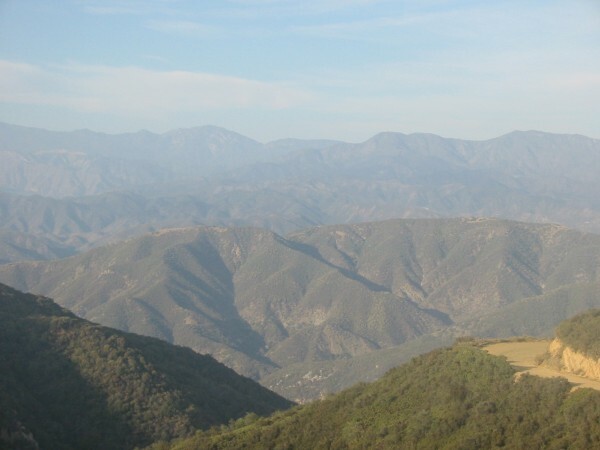 Best parts of this ride were climbing the Guadalasca switchbacks, then bombing down Fireline trail. Bikes are not allowed on Fireline, but a couple of serious female riders convinced me I would like it. 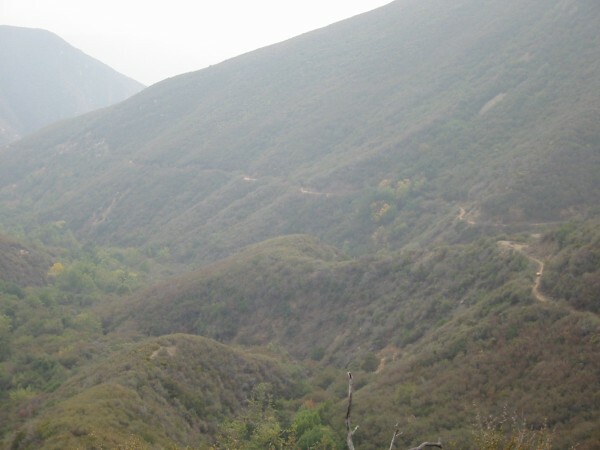 It drops about 750 feet in just over a mile and is very smooth, except for some very tight switchbacks. Did a 19 mile out-and-back here. Two significant climbs, Zuma Ridge fire road rising over 2000 feet in 3 miles going out, and about a 1000 foot climb coming back up the other side. 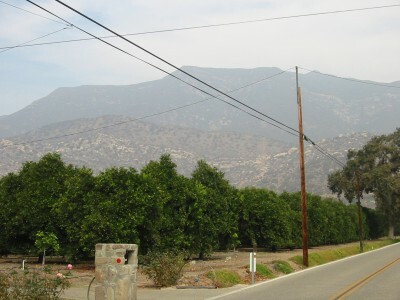 Started on Busch Road in Malibu. Very nice scenery here too. 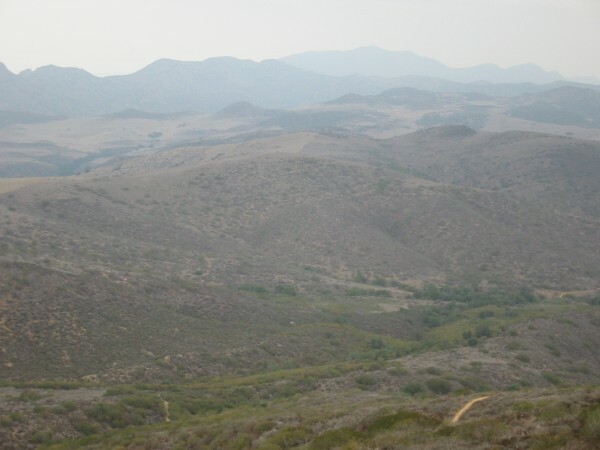 Took Zuma Ridge road up and over to Backbone singletrack trail, which runs for miles and miles through the center of the Santa Monica Mountains. 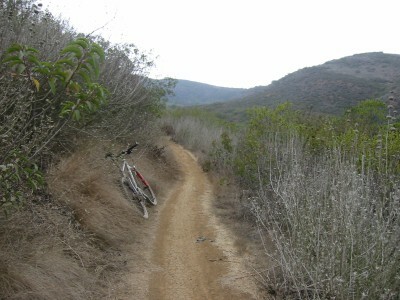 Parts are off limits to bikes, but the part I rode between Zuma and Latigo Canyon Road is open and a blast. Lots of moderate up and down riding, non-technical, generally fast. The 2000 foot fire road descent back to the car felt good after a day of 46 mountain miles riding. Parked at the forest ranger’s headquarters right in town (Ojai). After a little bit of pavement, the dirt climbing on Gridley fire road becomes very steep. 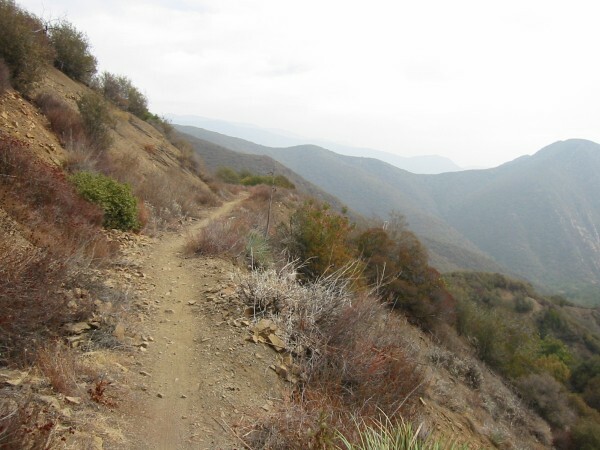 The fire road quickly degenerates into single track, and the slope the trail traverses becomes steeper and steeper as you work up the canyon. There are places, where if you went over the edge, nobody would see you again. 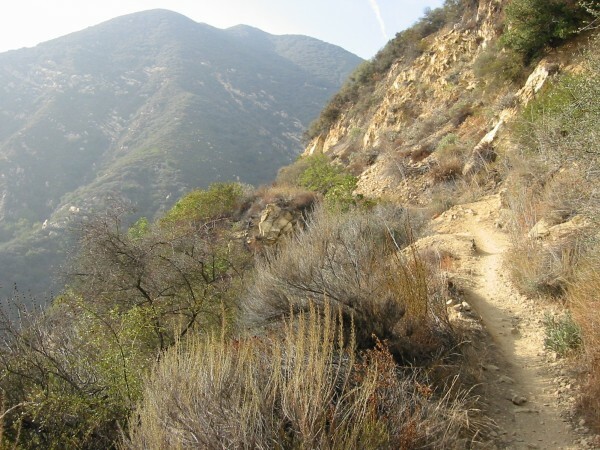 This trail is not for the faint of heart or those who have trouble clipping out (you know who you are!). 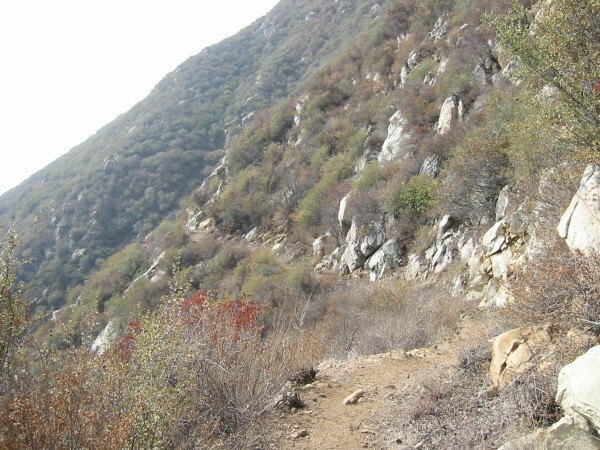 Trail is very narrow with loose shale, off-camber, rock slides to traverse in many places. 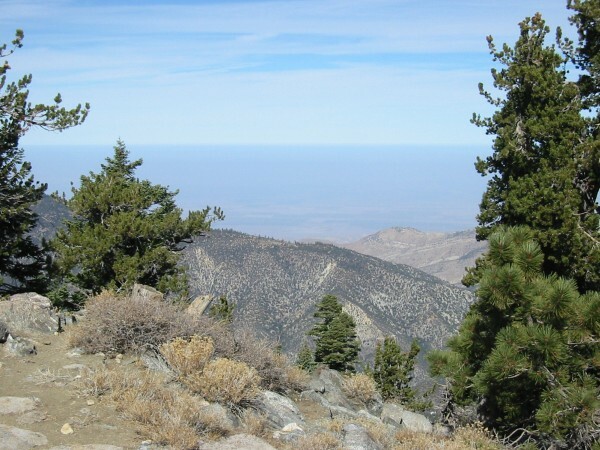 After 10 miles of near continuous climbing, Nordhoff Peak at 4485 feet is reached, for a gain of 3735 feet. The descent of Pratt singletrack is equally treacherous in places. Views throughout were nothing less than spectacular. This loop runs about 17 miles. Near top, beginning descent. Don’t want to go over edge here! Further down the mountain, near vertical drops off side of trail! Parked on pavement at gate to Romero Canyon fire road. Climb begins as a fire road and soon degenerates into a singletrack. Views of the canyon and coast are spectacular. 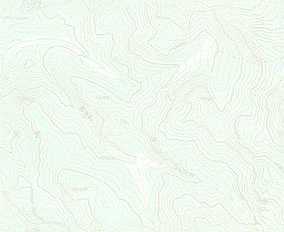 This trails also offers many opportunities to launch into nothingness if one is not careful. The trail runs up to Romero Saddle, a high ridge line with nice views of the coast. The out-and-back runs about 13 miles total and gains about 1800 feet. Parked at the bottom of Cuddy Valley Road, at Y to Pine Mountain Club. 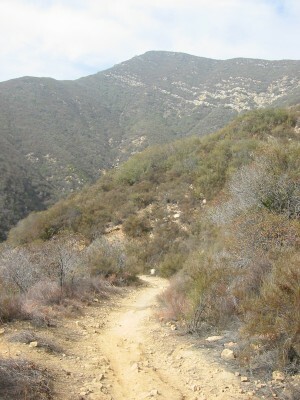 Then climb to summit is about 10 miles, 8 pavement/2 fire road at top. Total elevation gain is nearly 3000 feet. Quite cold at top, just a touch of snow around in the shadows. Some of the Sequoias where impressive. From the upper campground, singletrack is taken. 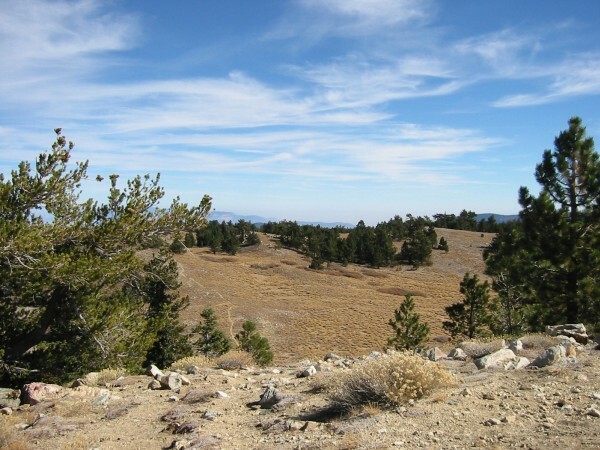 I took the Harvest Trail – South Ridge Trail – McGill Trail route down, for almost 8 miles of the finest singletrack descent you can find anywhere. 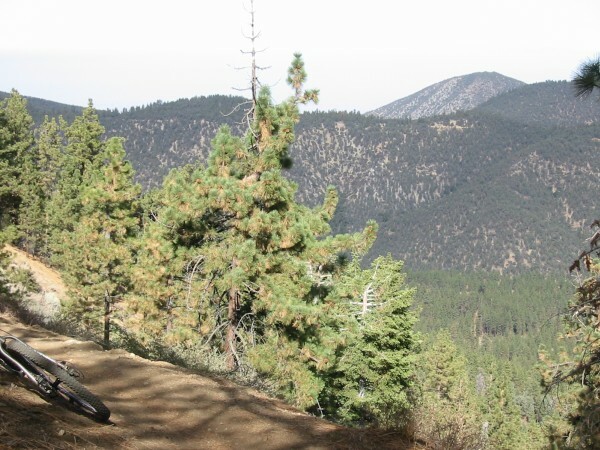 Eight miles of the smoothest carvable singletrack to bomb down. With views like this, it’s hard to keep eyes on the trail! Parked at entrance to park. 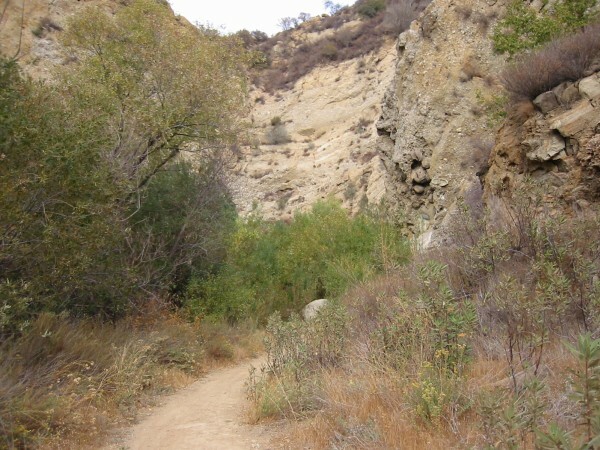 First time around this 5 mile loop, I took Wiley Canyon trail up. Some very steep section (hiked due to legs fried on Pinos in the morning). Many riders here, all coming opposite way. 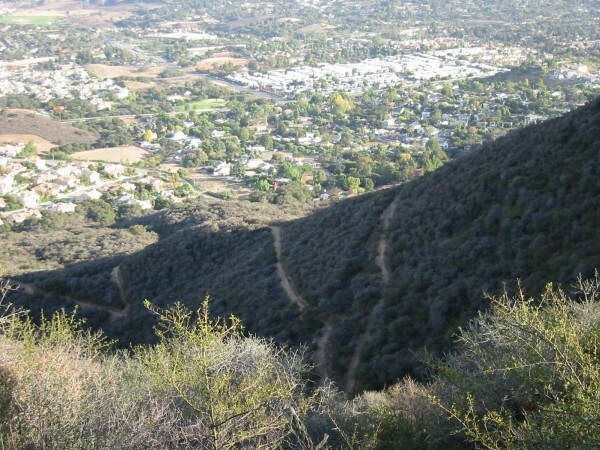 The trail climbs 1100 feet, with spectacular views of canyons and the town of Valencia from the top. 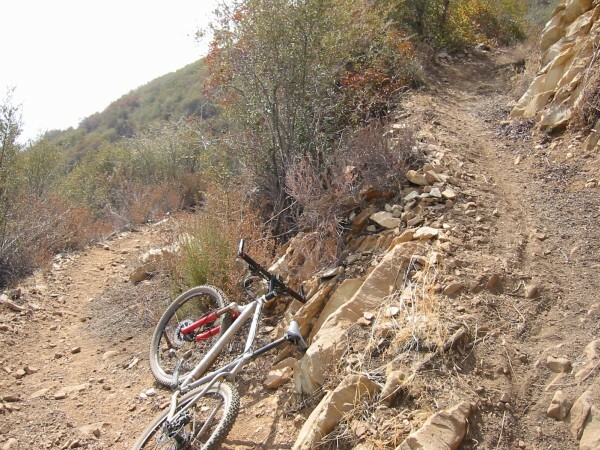 Coming down into Towsley Canyon on the switchbacks was a real test of switchback handling skills. I blew several of them. After finishing up the loop by passing through the very narrow Towsley Canyon gorge, I decided to ride the loop the other way, the way most other riders where going. The climb up the switchbacks was much less strenuous, and I cleared all but one of the dozen or so tight ones. 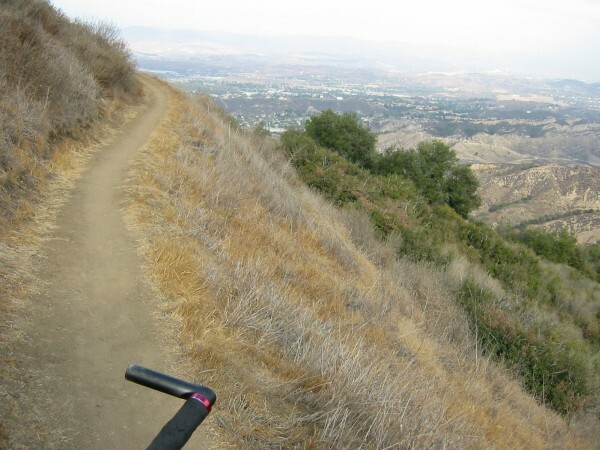 Then the descent into Wiley Canyon was a speed fest. My only crash during the whole trip was ripping back into the parking area, when I cut over dirt from pavement. Loose shell droppings from a big tree were very deep and I totally bit it at 20+ miles per hour. My big chain ring punched the distinctive pattern into my left leg in three different places, including my shin. Worst thing about it was there were witnesses. After picking acorn-like shells out of my elbows and knees, I limped back to the car to wipe up the blood. Despite the wipeout, this was a very fun ride. Originally I wanted to night ride this place since I stayed the first two business nights 5 miles away. Local bike shop said ranger who lives in park will catch you, will fine you $500, and he’ll feel good doing it. The park closes at sunset. Valencia in background. Nothing but smooth, rock hard, SoCal hardpack here. Started right from my hotel room, the Motel 6 in Thousand Oaks. Singletrack trail head is half mile away, and promptly climbs 750 feet up very steep mountain. 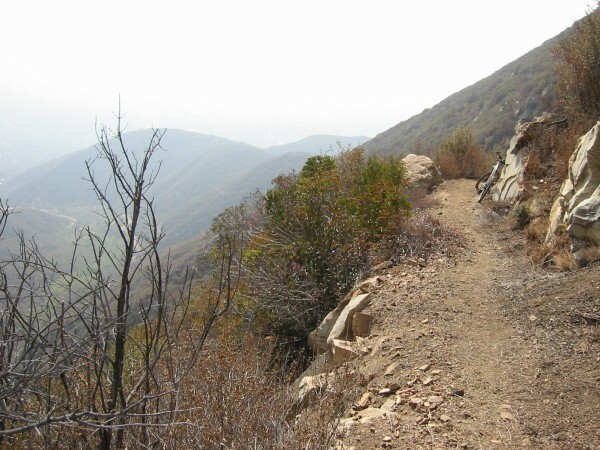 Trail itself is not that steep since it switches back many times during the assent. It’s hard to believe that singletrack this good is basically right in town. 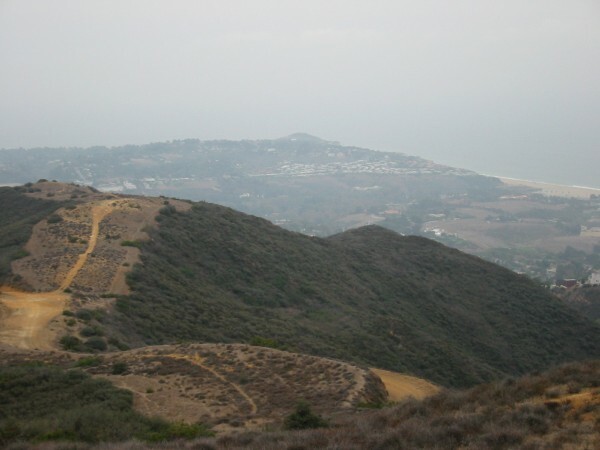 From this trail, you can reach all of the Santa Monica Mountains trails. I did 12 miles out-and-back on Los Robles and upwards of 2000 feet of climbing before having to jump on a plane to come back to 35 degree drizzly New Hampshire. Simply a blast to zip around on stuff like this!